Today's article focuses on the early mayors of Newark. The office of mayor is a relatively old one in Newark. It has been around for more than half of Newark's 331 years—for the past 161 years, to be exact. Originally, Newark was governed in much the same manner as were colonial townships all over theocratic Puritan New England. This form of government was perfectly adequate while the community remained relatively small, agricultural and homogeneous. But as the 19th century brought growth of population and the development of industry, and as newcomers from different ethnic stock began to arrive, complications emerged. On one hand, there was not an assembly chamber or hall large enough to accommodate the people attending the township's annual meeting, where policy for the next calendar year was decided. Furthermore, as commerce and industry began to emerge in what had been largely a rural or farming community, there were questions that demanded immediate attention and could not be postponed for the next annual meeting. Newcomers to the community who were not used to its Puritan limitations wanted their voices to be heard in government. Quite naturally, they felt excluded by the town's founding fathers. 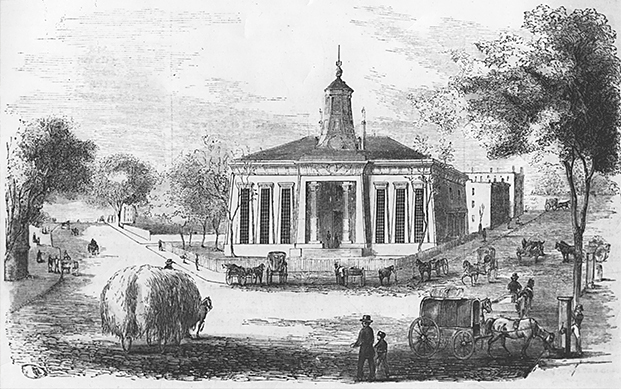 As a result, the 1830s was a time of great change, for it not only marked the beginning of a modern form of government, it was a time when Newark was connected to the rest of the country by railroads, was served by the Morris Canal, and played host to forceful industrialists, inquiring inventors and aggressive developers who entrenched themselves to make Newark grow on an unprecedented scale. In 1833, realizing that change was needed, the town leaders attempted to modernize the old township. They knew Newark had become too unwieldy to govern and decided to divide it into four wards, each in almost total control of its destiny, including the power to tax, spend revenues and appoint officials. A town council was created to represent the community as a whole, but its function was to perform only those acts entrusted to it by the four seemingly independent wards. Self-interest, greed and lack of concern for the community as a whole soon brought about the realization that this form of government was worse than the cumbersome one it was designed to replace, and the way was opened for the Incorporation Act of 1836. On March 18, a special election was held to decide if a new charter should be adopted. While several important real estate interests objected, the Newark Daily Advertiser was all for a fresh local start. Among Newark residents, 2,195 voted in favor and 325 voted against a citywide referendum. The morning after the election, the Advertiser's headlines read, 'The roar of the cannon announced to the town last night, the gratifying result of the election, which was conducted with entire good feeling and without any mixture of political prejudice.' The city of Newark had become a reality. The new charter specified there was to be a mayor and common council divided into four wards, several officials to implement the new government, and 13 or so standing committees to serve all the other needs of Newark's population, which had reached 20,000. While the new government was not perfect, it went a long way to successfully guide Newark through some of its greatest growth years until the later charters of 1857, 1913 and 1953. Aldermen were elected from each ward. You may recognize the names of some of them, such as Abraham W. Kenney, Isaac Meeker, William Rankin or William Garthwaite. City officials included a town recorder, city clerk, clerk of the common council, coroners and surveyor of highways. Standing committees included Finance, Street and Highways, Wharves, Commercial Affairs, Lamps and Watchmen, Fire Department, Public Grounds and Buildings, Schools, and Offices and Applications for Offices. Under Newark's 1836 charter, nine men served as the city's chief executive from 1836 to 1857. They were elected for one-year terms, and several were re-elected two or three times before returning to their regular occupations. The honor of being Newark's first mayor fell to William Halsey, born in Short Hills in 1770, a noted criminal lawyer described as 'one of the ablest and most enterprising men of his time and foremost intended to advance the welfare of the community, and throughout his long life (a man who) performed far more than a full share of unrequited labor as a citizen.' At 66, at a time when most men consider retirement, Halsey was pressed into service by his friends, neighbors and colleagues, an honor he could not refuse. In only one year, he saw the adoption of a city seal and made provisions for the construction of public buildings. The next nine mayors to follow Halsey occupied the remaining 20 years of the Charter of 1836. They were all members of the Whig Party. Theodore Frelinghuysen, Newark's second mayor, was elected to that office in 1837 and 1838. A former U.S. senator who lived on Washington Park, he served as president of Rutgers and was nominated for vice president, running unsuccessfully with Henry Clay in 1832. Mayor James Miller 3rd, who manufactured coach lace, was a lumber merchant and city alderman. He was also known for his role in the military, serving as a major general. Oliver Spencer was Newark's fourth mayor and New Jersey's first chancellor. William Wright, the fifth mayor, made his fortune manufacturing saddles. Later, he was elected to the U.S. House of Representatives as a Democrat after being defeated as a Whig. Steven Dodd served in the Legislature from both Morris and Essex counties. He was Newark's sixth mayor. A prosperous manufacturer, he produced firearms and surveyed instruments and machinery for both the woolen and cotton industries. Early in his career, he fought with William Livingston to operate a ferry service on the Hudson River to New York in opposition to New York's Robert Fulton. Isaac Baldwin, Newark's seventh mayor, and his partner, John Taylor, operated a highly successful jewelry manufacturing business. Baldwin served as president of the trustees of Old First Church. Beach Vanderpool, the eighth mayor, served two terms – beginning in 1846 – and was president of the Morris and Essex Railroad, and later the Lackawanna. He was also president of Newark's first gas company, and was reputed to be 'one of the wealthiest men in the East' in the 1840s. From 1848 to 1850, James Miller again served as mayor. James M. Quimby was elected Newark's ninth mayor, serving three terms while running the Quimby Carriage Co. In 1860, he was elected a state senator. From 1854 to 1856, Horace J. Poinier served as the 10th and final mayor on this list. His term saw the Asian cholera epidemic, which was blamed on 'unclean streets, rum and beer and Sabbath breaking.' Poinier became leader of a local 'Law, Order and Morality Party.' Salt of the earth, resolute, steadfast, dependable and stalwart were all terms used to describe these early Newark leaders, who occupied the office of mayor from the beginning of the modern city era until the eve of the American Civil War.